It wasn't until the opera bug bit me as a young teenager that I started branching out and discovering that all those great melodies could be sung in many idiosyncratic ways, and to very different effect. Via television and radio, I became a devotee of "little Renata" (Scotto), a great Met favorite at that time, whose lean, metallic sound struck my ears as particularly youthful and clean. As I began attending live performances more and more regularly, I gradually came to recognize and appreciate the vast variety of timbres, personalities and styles offered by the artists of the day and no longer expected that archetypal Tebaldi sound — a good thing, as no other soprano has ever reproduced it. The danger of such early familiarity with a great singer is that one often comes to take her charms for granted. Tebaldi always sounded exactly right to me, but because she was the first and, for a time, only example I had of how certain roles should be sung, I did not understand quite what a special thing her artistry was. My loyalty to Tebaldi was such a foregone conclusion that as time went on I did not listen as closely to her as I might to other less familiar artists, because I already knew what I was going to hear. The beauty of it, of course, is that later in life one has a chance to "discover" a beloved singer all over again in the context of many years of exposure to different interpretations, both live and on recording. The advent of podcasts and YouTube and the release of archival materials on CD and video has brought easy access to historic performances I had not encountered before, and in poring over them, I have relished the chance to listen old favorites with fresh ears. It's nice to know, in retrospect, that it was not ignorance that made Tebaldi seem so perfect: the warm, luminous tone, the unbroken legato, the infallible evenness from top to bottom of the register, the breath control and command of dynamics, and above all else, that rich, creamy, enveloping wave of sound, utterly devoid of shrillness, are sui generis. 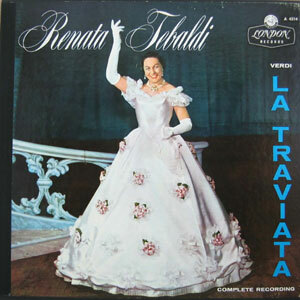 For vocal beauty and Italianate line, Tebaldi is still "it."